So here's a funny story - last year, I was approached by an indie rapper from Maryland asking whether I'd want to cover his upcoming album to be released in January. Now for me, I get a lot of requests to cover indie MCs looking for more coverage, but this looked on first impression to be more than just your standard free mixtape rapper. For one, he looked to have been around for a bit, with a few established albums he had sold from iTunes and a slew of mixtapes, all of which he apparently produced and mixed himself. That did get me intrigued - could we have another Logic or Big K.R.I.T. coming up, this guy could be something interesting. Not only that, he conducted himself with a degree of professionalism I definitely appreciated and wasn't simply spamming me. And I figured, 'Well, if he's wack, it's the middle of January, what the hell else am I supposed to cover around this time of the year?' Granted, that sort of logic got me to cover Rae Sremmurd, but a quick listen through a few tracks did show he was nowhere near that bad, so I added Brazy Da Bo$$ to my schedule. Fast forward to now, and said schedule is groaning under the weight of plenty of other albums that people have been eagerly anticipating like Joey Bada$$ and Lupe Fiasco and Sleater-Kinney and Viet Cong - and yet I'm taking the time to review an MC that doesn't have huge buzz or critical acclaim behind him? Well, for me it's a matter of pride to honor my commitments - and a need to get through some larger discographies on my schedule - and I did promise to review it, so after getting confirmation from the artist that he did indeed want me to cover it with my normal vitriol, I gave the new album from Brazy da Bo$$ a couple listens - did we find something good here? Well, it's alright. 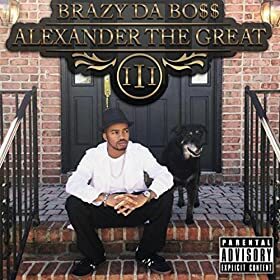 I'm not saying it's great or something you need to hear ASAP, but if you're looking for a pretty decent hip-hop record that's pretty conventional and chill in its subject matter with decent wordplay and surprisingly good production, you should look up Alexander The Great III by Brazy Da Bo$$. As such, there's not a huge amount I can say about it, outside of some of the lyrical subject matter not exactly being my thing, but it's competently executed, which is saying something. So let's start with our MC, and I will say that as a lyricist, Brazy Da Bo$$ isn't a bad MC - he does rhyme words with themselves a lot more than I'd prefer and some of his hooks can be a little basic, but when he gets a decent flow going, he's got some solid chains of rhymes that aren't bad. I'd be hard-pressed to find solid, memorable punchlines, but I get the impression more of his appeal is a laid-back chill sound that's more reliant on not caring and effortless charisma than going hard, more in the vein of Snoop Dogg or Wiz Khalifa. And while I'm not sure Brazy Da Bo$$ quite has it on the level of Snoop Dogg, his rhymes are better structured than Wiz's have been in a while. It helps that his guest stars are actually pretty solid - Trademark Da Skydiver's got a slick, well-executed flow that's the highlight of 'Tall Glass', C-Rayne makes the best of 'Ridin', even despite it probably being the weakest track on the album, Voppa Lucci drops a pretty effective verse on 'Body Somethin', and Matt G makes the best of the hype track 'Maryland'. But while Brazy Da Bo$$ might bring some technical skills, where this album stumbles for me in a big way is content - in that the majority of it feels pretty recycled. Outside of the frequent callouts for people to Google him or that he's listening to his own music - mostly in order to namedrop another of his records - he doesn't seem to have a lot to his personality and story beyond very stereotypical hip-hop. He's got his dance songs, his club songs, with plenty of weed, and while he's not as sleazy as some of his contemporaries, he's not exactly impressing me with incredibly interesting punchlines or bars or much of a story behind his songs outside of material I've heard hundreds of times before, and that doesn't make him all that distinctive. And the constant self-promotion doesn't help matters - I already bought the album, focus less on trying to make sure I remember your name and the album and more on delivering the content that I will remember, and saying you 'deserve it' doesn't win any points with me. But if I get anything from his vibe, he does have some chill, relaxed tracks like 'Tall Glass' and 'Life Is Good' that I did like where he acknowledges his success and realizes he's got nothing to complain about, which is a bit of self-awareness I liked. The one song that really stuck with me, though, was 'All Dogs Go To Heaven', a tribute to an old dog of his who passed away - and sure, the song is clumsy and a little corny at points, and it could have used a tighter edit to get rid of the sidetracking, and in sharp comparison to a song like 'Make Em Purr' by Sage Francis it's not even close, but the sentiment was well-executed and felt real, and I appreciated Brazy Da Bo$$ was able to put aside the bragging in order to get to something more honest. But let's be blunt here, the content is really nothing all that special, so why am I inclined to give him a pass here? Well, it might just be the production - and the funny thing is that I wouldn't say for the most part it's anything exceptional or innovative. I'm not quite sure what it is about the synth tones he chooses, but they aren't so much eerie or dark as kind of spacey and ethereal, a little more liquid without being oily, with the brassier elements clean without being overstated. Part of it comes down to the bass and beats - not quite as thuddingly heavy, with the percussion eased back in order to let the synth melodies drift across the mix more effectively, and while the vocal layering could use work to better fit our MC into the mix, it's a much more melodic mix and presentation than most modern trap-inspired production, and it does work. The title track synth tone is great, the layered snaps and beat against the gurgle and gentle shimmering waves of the keys on 'You Know', the clinking synth against the distant horns and pipes on 'Life Is Good', the stately horns and synths on 'Nonchalant' with the looser bass, the lumbering horns and organ on 'Body Somethin' and especially the piano and steel guitar on 'All Dogs Go To Heaven'. All of it comes together to accentuate the album's flow, with the only real dud for me instrumentally being 'Ridin' - the beat was punchy and strong, but the backing melody just felt swallowed and off-kilter and that synth over the chorus was so flat and atonal, it did not work whatsoever. But overall, I did mostly enjoy Alexander The Great III by Brazy Da Bo$$. I have a hard time calling it anything special on a lyrical level or thought-provoking, but to be fair it's not really trying for that lane, more content on chilling back and cutting a slick vibe. It really is a record that's coasting on good production, but Brazy Da Bo$$ does show potential if he wanted to come a little harder or put together more interesting songs. As it is with this, I'm inclined to be charitable and give this record a very strong 5/10, but only a recommendation if you're need a chill record that isn't really lyrical but can build a good mood. Otherwise... eh, Lupe and Joey Bada$$ are dropping albums this week, they'll probably draw more attention than this.